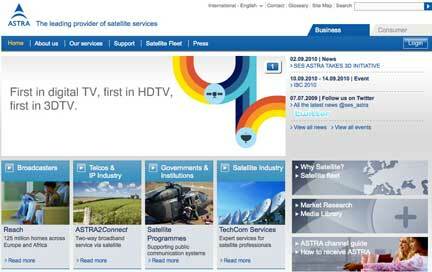 [SatNews] SES ASTRA, an SES company (Euronext Paris and Luxembourg Stock Exchange: SESG), announced a new initiative to support the introduction of 3D television in Europe. As part of the initiative, the industry reached a common understanding of the minimum technical specifications for the introduction of 3D television and broadcasting. The initiative is backed by SES ASTRA and major European broadcasters including public and private TV channels as well as representatives from the consumer electronics industry. Initial satellite 3D transmissions will use either the side-by-side (for 1080i resolution) or top-bottom (for 720p resolution) formats which make them compatible with existing HD STBs. Side-by-side and top-bottom are two transmission formats for 3D satellites broadcasts whereby two pictures will be arranged either horizontally or vertically in one frame. The delivery of two different images for the left and right eye is necessary in order to create a 3D stereoscopic experience for the viewer. Free-to-air 3D services will be signalled using mechanisms defined under an updated Digital Video Broadcasting (DVB) standard, which will allow automatic switching of the display from 2D to 3D and from 3D to 2D broadcasts.